Here are some snazzy birthday facts about 28th of December 1979 that no one tells you about. Don’t wait a minute longer and jump in using the content links below. Average read time of 10 minutes. Enjoy! What day was my birthday Dec 28, 1979? December 28, 1979 was a Friday and it was the 362nd day of the year 1979. It was the 52nd Friday of that year. The next time you can reuse your old 1979 calendar will be in 2029. Both calendars will be exactly the same! This is assuming you are not interested in the dates for Easter and other irregular holidays that are based on a lunisolar calendar. There are 253 days left before your next birthday. You will be 40 years old when that day comes. There have been 14,357 days from the day you were born up to today. If you’ve been sleeping 8 hours daily since birth, then you have slept a total of 4,786 days or 13.10 years. You spent 33% of your life sleeping. Since night and day always follow each other, there were precisely 486 full moons after you were born up to this day. How many of them did you see? The next full moon that you can see will be on April 19 at 11:14:00 GMT – Friday. Fun stat: Your first one billion seconds (1,000,000,000) happened sometime on September 5, 2011. If a dog named Nannette - a Korean Jindo Dog breed, was born on the same date as you then it will be 195 dog years old today. A dog’s first human year is equal to 15 dog years. Dogs age differently depending on breed and size. When you reach the age of 6 Nannette will be 42 dog years old. From that point forward a medium-sized dog like Nannette will age 4.5 dog years for every human year. King Taksin’s coronation achieved through conquest as a king of Thailand and established Thonburi as a capital. Osceola leads his Seminole warriors in Florida into the Second Seminole War against the United States Army. Indian National Congress, a political party of India is founded in Bombay Presidency, British India. The Lumière brothers perform for their first paying audience at the Grand Cafe in Boulevard des Capucines, marking the debut of the cinema. Wilhelm Röntgen publishes a paper detailing his discovery of a new type of radiation, which later will be known as x-rays. The first municipally owned streetcars take to the streets in San Francisco. What does my birthday December 28, 1979 mean? Your birthday numbers 12, 28, and 1979 reveal that your Life Path number is 3. It represents vision, imagination and joy of living. You possess a great talent for creativity and self expression. The following celebrities also have the same life path number: Jonathan Togo, Alley Mills, Evi Goffin, Ben Haenow, José Luis Garci, Taco, Manivannan, Dos Caras, Rance Howard, Chingy. 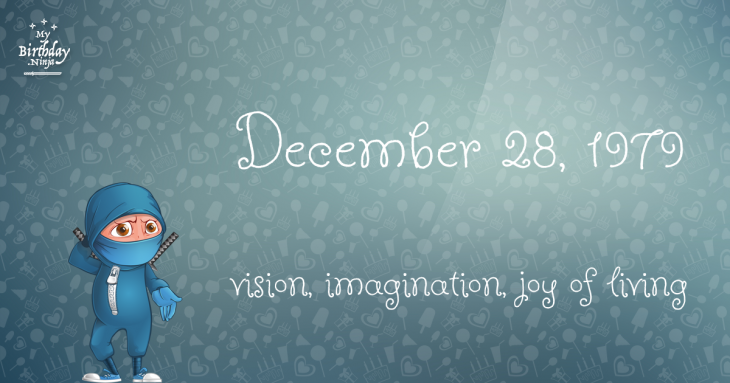 What is the birthday horoscope for Dec 28, 1979? The Western zodiac or sun sign of a person born on December 28 is Capricorn ♑ (The Sea-goat) – a cardinal sign with Earth as Western element. The ruling planet is Saturn – the planet of discipline. According to the ancient art of Chinese astrology (or Eastern zodiac), Sheep is the mythical animal and Earth is the Eastern element of a person born on December 28, 1979. Fun fact: The birth flower for 28th December 1979 is Holly for precious moments. What is the Love Match for Dec 28, 1979? When it comes to love and relationship, you are most compatible with a person born on January 1, 1995. You have a Love Match compatibility score of +111. Imagine being in love with your soul mate. On the negative side, you are most incompatible with a person born on June 7, 2005. Your incompatibility score is -127. You’ll be like a cat and a dog on a love-hate relationship. Arf-arf, I want to bite you. Meow-meow, stay away from me! The number-one hit song in the U.S. at the day of your birth was Escape (The Piña Colada Song) by Rupert Holmes as compiled by Billboard Hot 100 (December 29, 1979). Ask your parents if they know this popular song. How many babies were born on December 28, 1979? Base on the data published by the United Nations Population Division, an estimated 123,688,258 babies were born throughout the world in the year 1979. The estimated number of babies born on 28th December 1979 is 338,872. That’s equivalent to 235 babies every minute. Try to imagine if all of them are crying at the same time. What is the popular baby name on 28 Dec 1979? Here’s a quick list of all the fun birthday facts about December 28, 1979. Celebrities, famous birthdays, historical events, and past life were excluded. 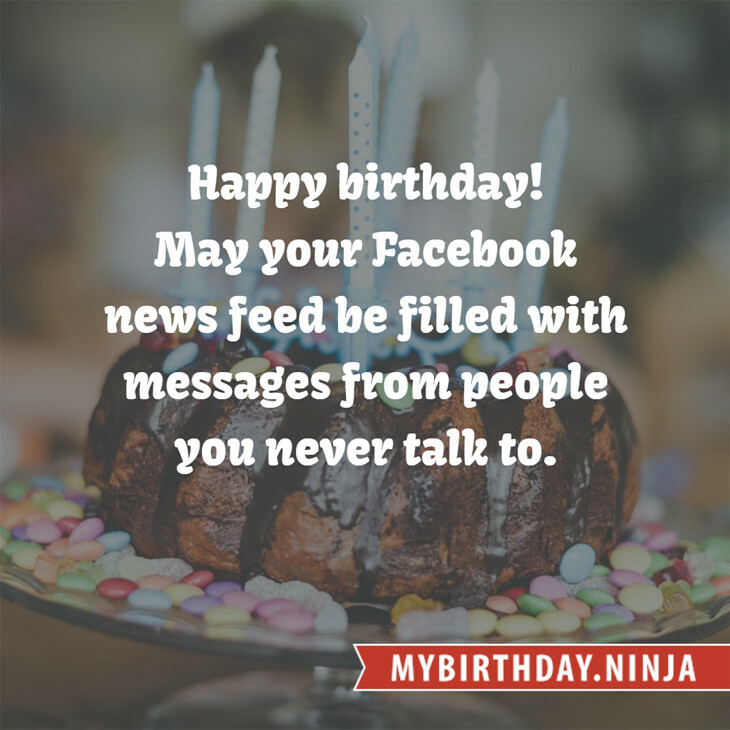 Try another birth date of someone you know or try the birthday of these celebrities: March 31, 1958 – Tony Cox, American actor and stuntman; May 8, 1984 – Julia Whelan, American actress; September 3, 1953 – Jean-Pierre Jeunet, French director, producer, and screenwriter.